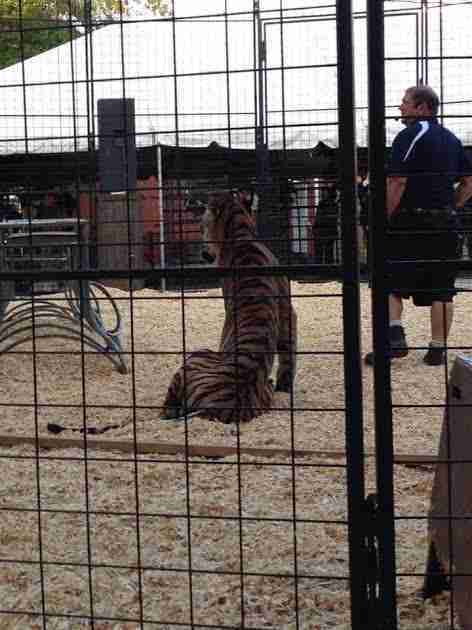 The trainer behind Missouri State Fair's "skeleton" tigers has a long history of animal mistreatment, according to one woman who says she worked for him in 2013. Liz Kibby says that Robert Mullen hired her to help with his Pets Overboard! show. Kibby only worked there a month - she left when Mullen didn't pay her, she said - and mainly worked with the domestic animals, but she told The Dodo that she saw multiple instances of mistreatment involving the exotic animals. 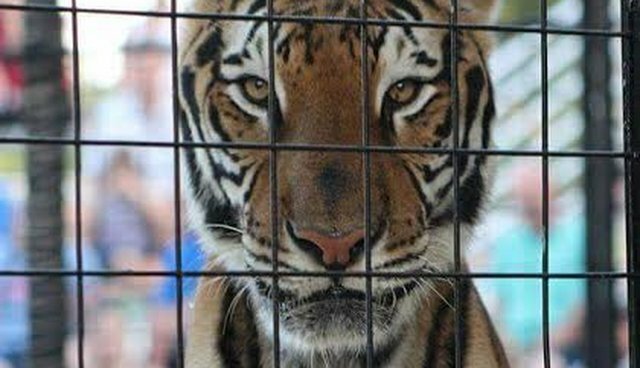 Kibby's claims add fuel to the recent outcry from activists and the general public over the condition of Mullen's tigers, who appeared to be emaciated in recent shows. Mullen and his wife, Christy, did not respond to multiple requests for comment. In one incident, Kibby says, Mullen was supposed to perform at a Cape Cod, Massachusetts, fair with his big cats but the transport vehicle broke down. Mullen didn't want to miss out on the fee, according to Kibby, so he decided to cart the tiger up however he could - which turned out to be in the back of a pickup truck. 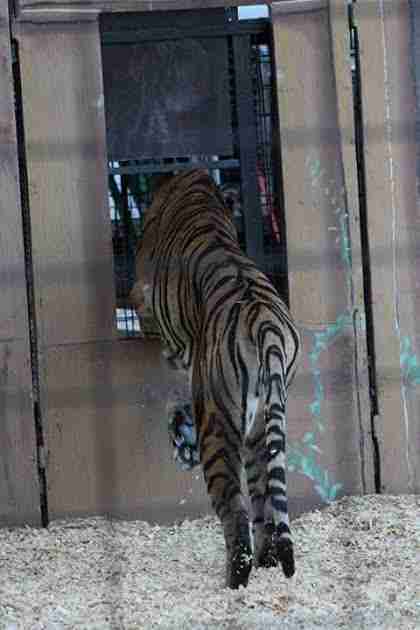 Kibby said that Mullen ramped the tiger's crate into the back of his truck and covered the sides of her cage with plywood boards so no one could see her. The cat was left in the crate for the 24-plus hour drive from Orlando, Florida, to Cape Cod, with no opportunity for exercise, according to Kibby. "Obviously it's super illegal to transport an animal like that," she said. "They just kept her in her cage." Kibby, who was just 21 at the time, said that she knew that the animals were being mistreated, but she didn't know what to do about it. "At that point I should have turned around and reported it," she said. "But this guy is awful. He's so manipulative." It wasn't just the big cats who were at risk. One day, Kibby said, Mullen left the premises for a few hours, leaving a host of animals including two macaws, a lemur, a capuchin monkey and an anteater outside in the heat. "It was over 100 degrees out, and they had no water," she explained. Though Kibby wasn't supposed to work with the exotics, she knew she couldn't leave them to suffer and took the time to water them all. "I wasn't supposed to be in with them and I put myself in danger to do it," she said. There were also altercations between the big cats and the staff, who use questionable direct contact methods to handle the animals. In one case, Kibby said, an employee was attacked by a lynx mix. "I remember one day one of the the animal trainers was, I think, taking him out or putting him back in the crate and she ended up getting all scratched up, on her face and arms," Kibby explained. "They ended up covering it up." 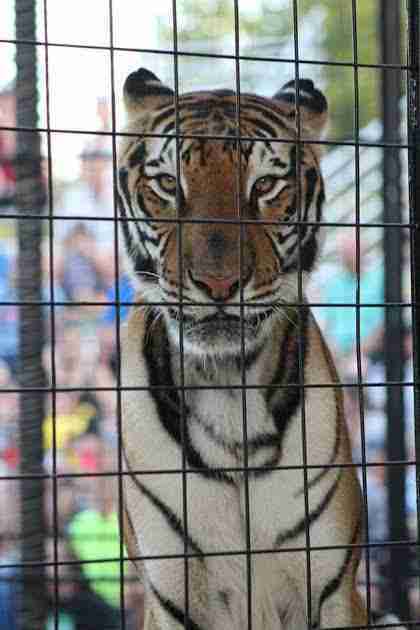 The Mullens, who run the Orlando, Florida–based PM Productions Entertainment Inc., are currently in the spotlight due to concerns about the animals at Robert's ongoing Missouri State Fair show: The tigers are severely emaciated, with prominent spines and hip bones, and visitors are are calling for officials to step in. The Dodo spoke with several big cat experts about the Missouri situation, all of whom confirmed that the tigers were underweight and said they believed Mullen was withholding food to make them perform. Kibby said she didn't work closely enough with the tigers to comment on their diets, but provided upsetting details about their treatment based on the interactions she did have with them. For one, she said, Mullen plays a pre-recorded tape at his shows that says his animals always have veterinary care and are accompanied by a vet when they travel - but Kibby said that it wasn't true based on her experience. "That's not even close to the case," Kibby said. "I never saw them treated by a vet." Kibby said she believes the travelling vet Mullen referenced in his pre-show recording is Christy Mullen. But her company bio lists Christy as having a bachelor's in biology and several years of veterinary experience, but no veterinary degree. And Kibby said she barely saw Christy during her time working for the Mullens. To the contrary, Kibby says, she saw the animals actively denied medical care. After the trip to Cape Cod, she noted, one of the conures got sick. "It wasn't moving, it just got really bad," she said. "The girl who was in charge, she called Robert, and he said, 'Give the birds some blankets' and stuff." The bird fortunately recovered, Kibby said, but she was shocked he wasn't given medical care. Of course, the most concerning accusations the Mullens are facing right now are the claims that they use food deprivation to make their tigers perform. Kibby said that while she didn't know whether the tigers were being starved, she saw something similar happen with a domestic cat at a Virginia show. "One of the house cats, I think there was something wrong with it, it just stopped doing tricks and stuff," Kibby said. "He stopped feeding her, and he said she couldn't eat unless she performed." She added that Mullen used to angrily accuse her of feeding the cat behind his back. Kibby's account is just the latest in the series of accusations against the Mullens - several animal welfare groups have spoken out, and visitors have said the tigers looked lethargic or even drugged. Susan Bass, public relations rep for the Florida-based Big Cat Rescue, told The Dodo that "it's been awhile since I've seen animals in such bad shape." But officials seem to be turning a blind eye - both the Missouri State Fair director and a vet who supposedly checked on the animals denied any problems. Yet animal lovers aren't giving up, and hope that collective outcry can help get these tigers the help they need. If you'd like to help, you can let the Missouri State Fair know how you feel by clicking here. The Wildcat Sanctuary has also compiled a list of ways you can help.